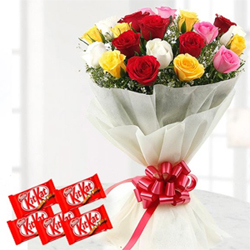 Add the beautiful hues of the rainbow and sweetness in your loved one�s life 12 Mixed Roses 5 Nestle KitKat. 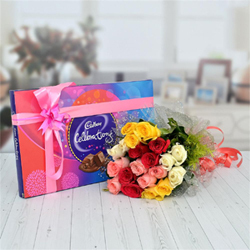 12 pink roses bunch + small Cadbury Celebrations box . 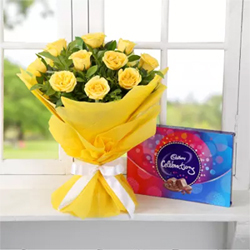 12 yellow roses bunch + small Cadbury Celebrations box . 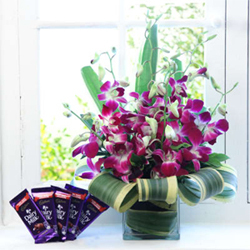 A delight to the senses, this gift comprises of gorgeous 6 purple orchids basket 5 bars of Cadbury Dairy Milk chocolate . 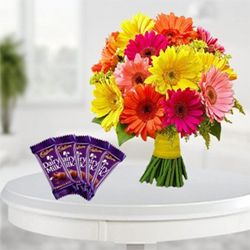 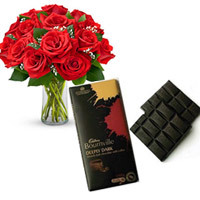 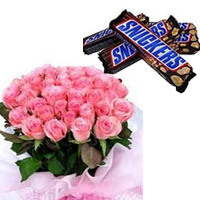 The bouquet includes 15 fresh pink carnations+ Cadbury Dairy Milk Silk 60gms (2 units). 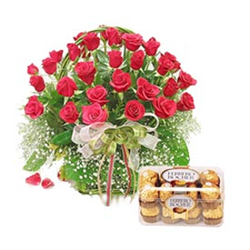 12 Red roses in a bunch 16 pcs ferrero rocher chocolates box . 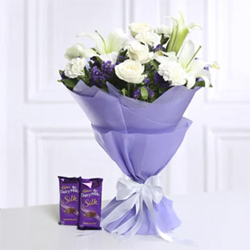 Bouquet of Mix Flowers White 4 Roses, 2 Lilies , 4 Carnation In Tissue Wrapping Cadbury Dairy Milk Silk 60gms (2 units). 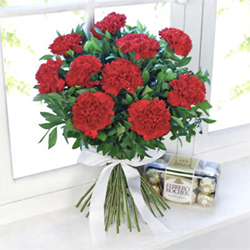 This exclusive bouquet of 10 red carnations, along with a pack of 16 Ferrero Rocher chocolates. 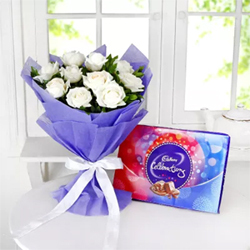 Bunch of 6 Purple Orchids in a cellophane packing with Purple Ribbon and 16pcs Ferrero Rocher chocolate box..
Ferrero rocher 16 piece box with 10 red roses in a basket. 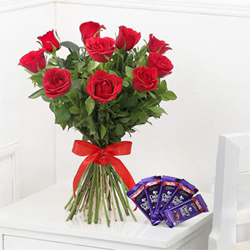 Rosy Rocher Bouquet - 16 yummy Ferrero Rocher chocolates on the periphery and 10 fresh Red Roses. 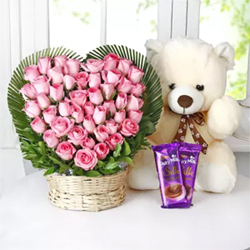 10 Ferrero Rocher chocolates bunch 6 inches teddy. 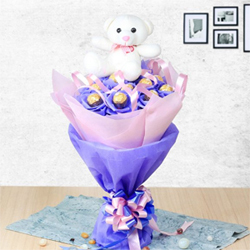 This combo consists of a bunch of 10 Roses with a cute 6" Teddy and 16 Ferrero Rochers..
15 Multicolor roses bunch (5 white, 5 red, 5 yellow and 5 pink roses), 5pcs Dairy milk silk chocolates each one 55g. 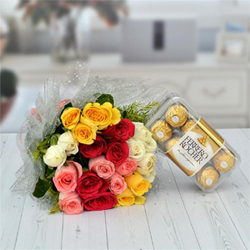 This Combo consists of 12 Yellow Rose bunch wrapped with a beautiful paper packing, 16 Pcs Ferrero Rocher and a 6" cute teddy. 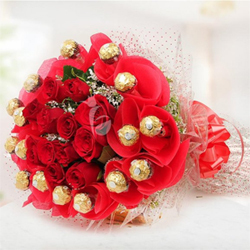 20 multicolor roses bunch (5 white, 5 red, 5 yellow and 5 pink roses), ferrero rocher - 16 pcs. 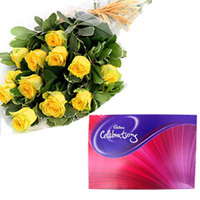 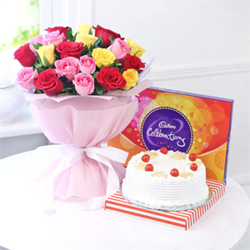 Bunch of 20 Mix Roses with Cadbury Celebrations 118gms & Half Kg round Pineapple Cake . 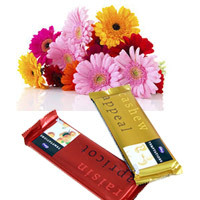 The gift contains a combination of 5 White Lilies With 5 Red Roses along with 2 bars of Temptation chocolate. 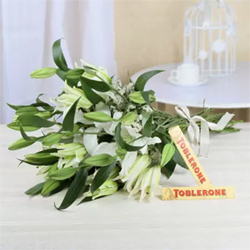 Round Bunch of 6 Yellow Asiatic Lilies in a white paper packing with orange ribbon bow & lot of white fillers 16 pcsFerrero Rocher Chocolate. 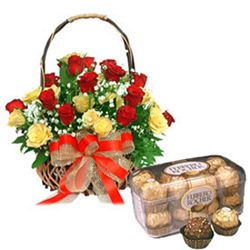 The hamper comes with 30 Red and Yellow Roses in a round shaped basket and 16 pieces Ferrero Rocher chocolates.. 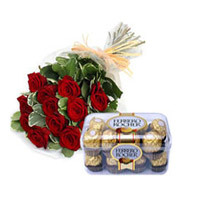 This gift hamper including a bunch of 25 assorted roses and a packet of tempting 16pcs Ferrero Rocher chocolates. 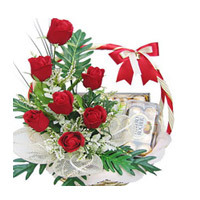 Basket of 30 Red aromatic Roses along with a box of 16 Ferrero Rocher Chocolate. 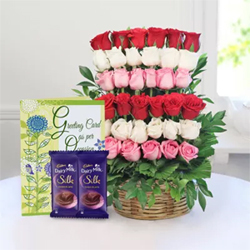 Send this Gift Hamper to your loved ones in India. 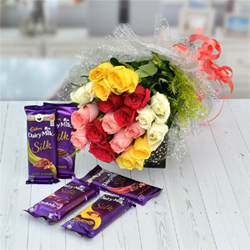 Round Handle Basket Arrangement Of 35 Mix Roses Cadbury Dairy Milk Silk 60gms (2 units) Greeting Card . 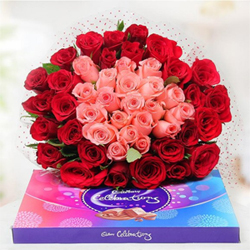 This Bunch consists of 50 Roses, 30 Red Roses forming the outer ring of bouquet and 20 Pink Roses forming the inner core. 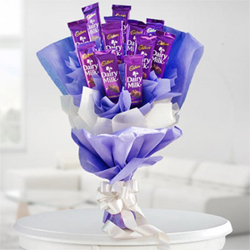 Together with this beautiful arrangement comes a cadbury celebrations pack of 118.4gms. . 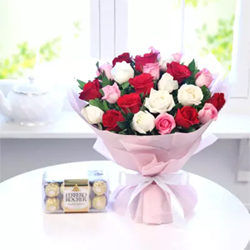 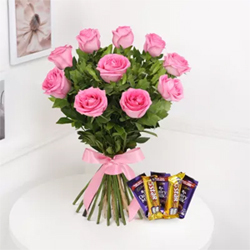 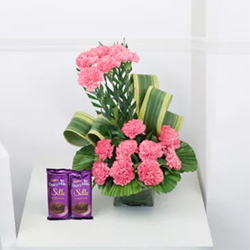 Choose this wonderful combo consisting of a gorgeous bunch of 12 orchids along-with a box of 16 scrumptious Ferrero Rocher Chocolates..
35 Pink Rose Arrangend In Heart Shape Basket Cadbury Dairy Milk Silk 60gms (2 units) White Teddy 12 Inches. 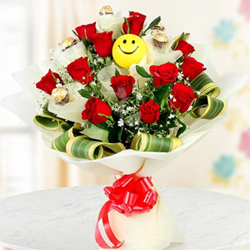 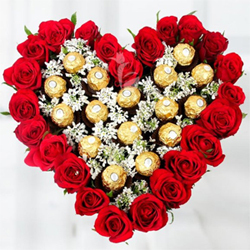 Heart shaped bouquet of 25 Red Roses Arrangement of 16 Ferrero Rochers in Bouquet Centre. 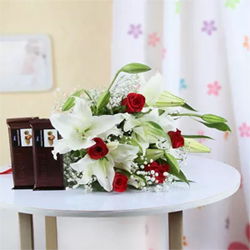 Send a romantic message of 'I love you to the moon and back' in a special way to your sweetheart Bunch of 10 White Lilies with 2 Toblerone Chocolate Bars. 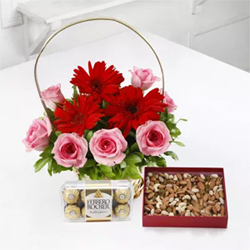 Basket of 10 Mixed Flowers With 400 Gms Dryfruits & 16pcs Ferrero Rocher chocolates . 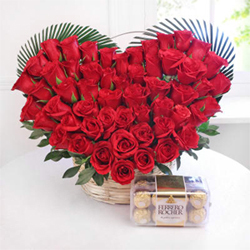 Heart Shaped Arrangement of 50 Red Roses with 16 Pcs Ferrero Rocher Chocolate.